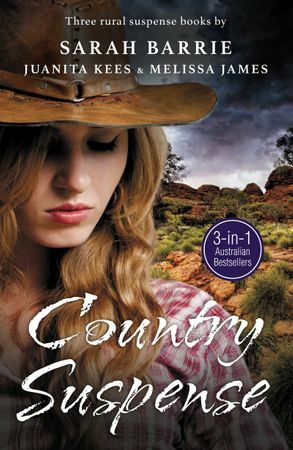 A collection of rural suspense stories from three bestselling Australian authors. Widowed, in debt and under suspicion of arson, Alissa Morgan-Jones sees taking over her mother-in-law's isolated farm as an opportunity to get herself back on her feet. Four years after fleeing the scandal that ruined his career, disgraced lawyer Cameron Blakely has a new life in Hunters Ridge. And when the new girl in town takes over the farm next door he's drawn to her immediately. But there are secrets in both Alissa's past and Hunters Ridge. Lurking in the isolated wilderness is a danger that neither anticipates - but one that threatens everything: the town, their love, and their lives. When spray drift ruins his crop, Harley Baker wants to confront his neighbour. But arguments are tricky when it's the woman he's loved his whole life. Flying Doctor Elly Lavender has spent years on the run from an obsessive former patient who will do anything to force her to love him. When her most recent cover is blown, she runs for help to her childhood friend and outback cop, Adam Jepson. Sarah Barrie is a bestselling Australian author writing suspense in rural settings. Her debut bestselling print novel, Secrets of Whitewater Creek, earned her a spot as one of the Top 10 breakthrough authors of 2014, and her next three books, the Hunters Ridge series, also reached bestseller status. Sarah has also worked as a teacher, a vet nurse, a horse trainer and a magazine editor. When she's not writing, you'll find her ferrying children to soccer or gymnastics, or trudging through paddocks chasing cattle, sheep, chickens or the Houdini pig that never stays put very long. Occasionally, she'll attempt to ride her favourite horse, who's quite a bit smarter than she is and not always cooperative. Her favourite place in the world is the family property, where she writes her stories overlooking mountains crisscrossed with farmland, bordered by the beauty of the Australian bush, and where, at the end of the day, she can spend time with family, friends, a good Irish whiskey and a copy of her next favourite book.